To state the obvious, no person has ever meant more to the Indiana Fever franchise than Tamika Catchings. The statement cannot be debated. The only person worthy of any debate might be President and GM Kelly Krauskopf who is the lone chief executive in club history and the person who had the gumption to draft the still-injured college star from Tennessee in 2001. Kelly deserves enormous credit for her vision and patience in selecting a player who would eventually bring riches to the then-fledgling women’s sports franchise. Tamika came to Indiana in 2001 as a basketball player. Her playing career closed in 2016 when she retired from the active roster as an internationally recognized and nationally acclaimed citizen and ambassador. Never mind the Olympics basketball record with four golds from Athens, Beijing, London and Rio; or her MVP awards and annual WNBA accolades; or the Fever’s 13 playoff appearances and a 2012 championship. Tamika Catchings walked off the court as a symbol of good. A symbol of sportsmanship and teamwork. A symbol of perseverance and overwhelming competitive drive who learned to outwork everyone around her. She became symbol of character, a symbol of giving and a giver of hugs and smiles. Tamika has been the Fever’s greatest basketball player. She became a legendary figure in the world of women’s basketball who soon will earn induction in the Women’s Basketball Hall of Fame, perhaps even the Naismith Hall of Fame. She left the court as so much more than a basketball player though, and her living legacy continues shining — perhaps even more brightly — now, as a local business owner, a civic leader and advocate for youth, and a franchise representative that helps build the brand and develop younger athletes for their own futures, on and off the court. When Kelly Krauskopf chose Tamika Catchings on April 20, 2001, she chose a great young basketball star, albeit tarnished with a torn ACL. That briefly tarnished talent was driven to be the best player she could be, though, and she became the gem that keeps on giving… and giving… and still giving to this franchise and the Central Indiana community well past the end of her playing days. 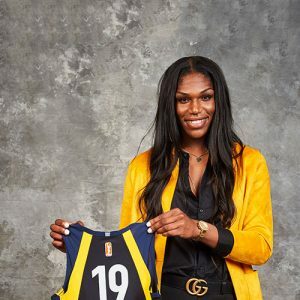 Her name and presence now lift the Fever and Pacers brand by affiliation alone, even when she is not giving in the franchise name. Her impact is bountiful and residual. 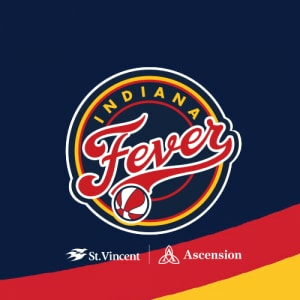 You’ve heard of “guilt by association?” The Fever and Pacers reap benefit by association with Tamika Catchings and her 13-year old Catch The Stars Foundation (CTSF). I have had the pleasure of working beside Tamika for the past 15 years, the final 14 of her 15 active seasons on the court. Tamika gave me constant story material as well as a smile and courteous response to nearly every request that came her way — even when she was tired of interviews or tired of hearing from me! I have been fortunate to maintain a unique perspective throughout her now-transitioning career. While a trainer’s relationship with a player may be more person — constructed over countless hundreds of hours of treatment before and after every practice on a training table; or throughout the rigor of rehabilitation from injury — my relationship with Tamika has been more business-like and often more social. My role with her has been off the court, helping to put her in the right place, at the right time, for media or public events. Like the trainer from the solace of the training room, I am the background guy on the other side of the camera. I spent two hours with Tamika on Monday afternoon at her new tea cafe while she spun her way through a dozen media interviews. Watching her, I reflected. These are my reflections on 15 years with No. 24 – the first, last and only Fever player ever to wear No. 24. Tamika learned from her Christian family and by following her NBA dad, Harvey, during community visits during his basketball career. Harvey took the kids on trips to shelters; the family volunteered their time while Dad was the star player. Young Tamika learned to give. Tamika also overcame the obstacles of a hearing disability. Her coach and friend and mentor at the University of Tennessee, Pat Summitt, taught Tamika that with her talents and her celebrity, she had a platform and the ability to impact lives. Earlier in our careers, I attended annual WNBA All-Star Games, and Tamika was an annual participant. My job was usually to make sure she got from places A to B to C, on time and with the appropriate items for an applicable photoshoot, or autograph session, or clinic or even practice with the All-Star Team. I quickly learned she is self-sufficient. She didn’t need me to hold her hand. She already was prompt and on time. But one of her pet peeves, I learned, was waiting. So my biggest task became tapping her on the shoulder when everybody else was in place for the team photo when fans and kids and autograph seekers surrounded the court during a public practice. Tamika would much rather engage with fans and sign autographs than wait for other players to gather. Once everyone was in place, I tapped her shoulder. She apologized to the fans and hustled into the photo. Engaging the fans was Tamika’s priority. Her giving and caring was no more evident than during her final season when she embarked on her ambitious Legacy Tour. It was her tour, done her way, and with her own personal touch and interaction. CTSF staff and/or her mom, Wanda, or sister, Tauja, traveled to every city with suitcases of equipment and items for a silent auction. Tamika made a postgame appearance in every WNBA city and donated $2,000 to a charitable foundation. She talked with fans and signed autographs that stayed for her postgame event, often signing for more than an hour or two after the game had ended. When she conducted her Legacy Event in Indianapolis, she signed every single request and left Bankers Life Fieldhouse after 1:00 in the morning. One of the most memorable events I can recall came after losing a devastating Game 5 in the 2015 WNBA Finals in Minneapolis. The losing team players and coach typically attend a press conference with media, first, while the winning team celebrates on the floor and then its locker room. While walking out of the news conference with Tamika, I began guiding her down the hallway to our left, toward the visiting locker room. Tamika, though, veered to the right, intentionally, toward and into the Lynx locker room. I reached to grab her until I realized what she was doing. She walked straight into their champaign celebration and hugged and congratulated the Lynx players in full celebration. It was a classy, unforeseen move. I was humbled at watching her. The Lynx players were humbled in welcoming her. Media and league representatives watched her in awe. Even in defeat, she showed all of us the raw meaning of class, humility and sportsmanship. She impacted our hearts. Tamika exhibits the same traits as a philanthropist and businesswoman that made her an MVP athlete. She is absolutely committed and dedicated to every task at which she participates. Her drive exceeds that of her competitors. Her two-way effort on both sides of the basketball court are what made her legendary – piling up offensive and defensive numbers like no player in the history of the game. Diana Taurasi may have recently become the top scorer in WNBA history, but Catchings is third in scoring and No. 1 in steals and rebounds and free throws. She also is in the top dozen all time in assists and blocks. Tamika did EVERYTHING on the basketball court and she wouldn’t have it any other way. The Catch The Stars Foundation has flourished and continues growing every year. She has relationships with camps and clinics all around the country, and she has designs on spreading her mentoring sessions, scholar-athlete program and other programming to other cities, too. CTSF began a relationship with the NCAA, hosting an AAU tournament in the city of the Women’s Final Four two years ago. It is her passion and she will succeed because of the same drive we saw on the basketball court. Her newest venture was the purchase of Tea’s Me Café (140 E. 22nd St.) on the north side of downtown Indianapolis. The tiny café had become a go-to quiet space for her relaxation and planning while she was downtown during her playing career. When she heard it might close, she stepped in to ensure its standing in a tidy community undergoing restoration. But owning it wasn’t enough. She has added an app and online ordering, and has used her unique celebrity to market its business. She even has plans for expansion. Tamika doesn’t believe in shortcuts and everything has a plan. During her final season, she was essentially managing simultaneous careers: player and businesswoman. Her calendar was bulging at the seams between practices, games, travel and meetings and events surrounding CTSF and the Legacy Tour. To maximize her media with some efficiency, she agreed to a series of bi-weekly conference calls that we conducted primarily for national media, or media in each upcoming city. When the tragic news arrived of Pat Summitt’s passing last season, Tamika was obviously distraught. The Fever had an afternoon game at Chicago the next day. She did not travel with the team and I held a half-dozen media requests for comments about her legendary coach. In true Tamika-fashion, she fought through emotion to conduct a late-evening conference call while driving with her sister to Chicago. 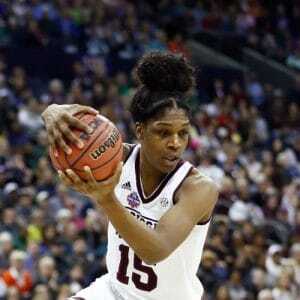 She scored 26 points against the Sky just hours later, pointing skyward after each basket. I have rarely seen an athlete so personally driven then on that day. Ironically, it was her last game in Chicago. Following the game, she conducted another postgame Legacy event with more autographs. She is an athlete and a person whose laser focus won’t be denied. Early in her career, she was a leader by example, usually not as vocal as she became later. By the end of her career, she was a coach on the floor — and in the locker room. She was quick to take control of difficult situations and often made heartfelt pleas with her team before or after games — instilling her passion into her teammates. She was accommodating to media or other requests before or after games, but she was religious (pun intended) about attending a pregame chapel session and would not allow distraction from that point until the final buzzer. She likely won’t embark on a new project without confidence and belief she’ll make it a success. She has long said she doesn’t want to coach, and I was surprised within the past year when the once-shy athlete that was self-conscious about her speech became a TV analyst for college games; and now the Fever. Again, though, she was given a platform, and nobody knows the game better than Tamika. I smiled last month when she emailed me asking for game notes prior to her first game covering the Fever on May 24. Preparation is her key in every venture. There is not another star that is more approachable than Tamika. Whether in front of teammates, coaches, other players, team executives, kids, friends, family, government officials, civic leaders, business associates, media or fans — Tamika is welcoming and engaging. She is equally as comfortable talking to a 6-year old as she is chatting with teammates; or welcoming a visit from the Indianapolis Mayor or Indiana’s Governor. One of my favorite moments with Tamika was during the moments following our 2012 championship. It was her time to shine, and with the championship and MVP trophy came standard media obligations, plus a few extra. She left her own champaign celebration in the Fever locker room to conduct 30-40 minutes of interviews — a press conference, several one-on-one interviews and a hallway phone call with Sports Illustrated prior to taking more photos with her family and the championship trophy. She was exhausted by the end, but she greeted every opportunity with a smile and a thank you. On multiple occasions, Tamika has welcomed media into her home for various interviews or photoshoots. Whether in those circumstances or engaging with her family at CTSF events or while traveling, I am struck by one commonality — Tamika is an extraordinary sports figure who is otherwise a common and ordinary citizen whose greatest passion is helping others around her. She has a star’s platform, but she’s more interested in being a wife, a sister or Auntie Tamika. While watching her conduct interviews Monday at Tea’s Me Café, I was struck by the number of hugs she gave. It didn’t surprise me — I get a hug from her almost daily. It is how she greets everyone. At Tea’s Me, she hugged customers and, before and after each interview, she hugged both the reporter and the cameraman. The one competition (four of them, actually) I’ve not attended with Tamika during our 15-year tenure has been the Olympics. But I have heard from USA Basketball publicist Caroline Williams and from two different local media members who followed her to Rio. After the USA’s gold-medal press conference, Tamika hugged all the media and thanked them. Who does that? Tamika did that. I might also have used stubborn as one of Tamika’s character traits. Not really, but yes, she is strong-willed, as you can imagine. I think there was only one time in 15 years that I ever persisted in trying to get her to change her mind. When her mind is made up, there is little to change it. I rarely tried. 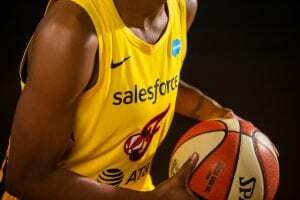 When she and the Fever were preparing for the 2016 season, both planned to use a hashtag or slogan for the season — the team for its season-long marketing collateral; Tamika for her Legacy Tour and other CTSF materials. Our marketing staff had already planned its #24Forever hashtag for promotional purposes. Tamika was considering a similar tag that worked nicely with a cool logo that had been produced for CTSF: the #24 was placed neatly within the word “Forever.” #24Forever had been used with Kobe Bryant’s retirement in L.A. only a year earlier though, and Tamika wanted something different. She wanted something that belonged to her! Pronounced verbally though, the #For24Ever hashtag sounded like “For 20, 4 Ever.” It was easily confused with “420 Forever.” Google it. That was the basis for my persistence. Thankfully, Tamika made another great decision and the rest is history. The Fever and its greatest star marketed her final season in unison with the same #24Forever hashtag. Indeed, #24 is forever. We celebrate it again this weekend. The number will continue to live as part of her always-engaging life among us, and in everyone she touches.. but it will forever be retired from appearing on a Fever jersey.